This past weekend, I finally got around to paying an “official” visit to the Flying Fish. Actually, it was two visits on the same day that was motivated by something that I wanted to do for a long time. Inspired by an experience at a wing joint several years ago, I’ve began a quest to find good cheeseburgers in the unlikeliest places. However, I’m a terrible procrastinator when it comes to pursuing goals. Fortunately, circumstances facilitated the dual visit to the seafood eatery that is the sister restaurant of the Flying Saucer. Although I will eventually get around to reviewing the aforementioned wing joint (Best Wings of Memphis), I have no regrets about starting my burger quest with the Flying Fish. Before I talk about the cheeseburger, I want to focus on the seafood. 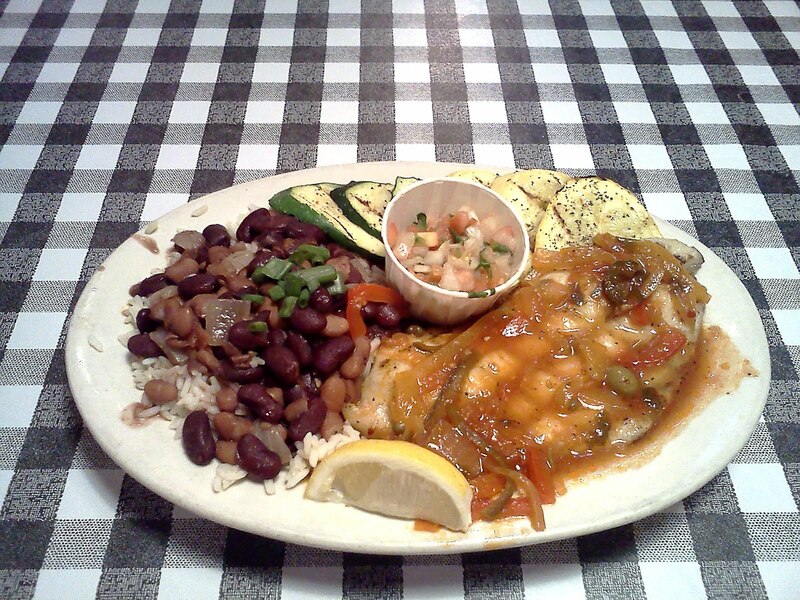 For dinner, I had the grilled catfish with beans & rice, squash and zucchini. When I ordered it, I asked about the Veracruz sauce that the restaurant featured on its “grilled” menu. Based on its description, I wisely chose to have it added to my catfish. After placing my order, I received a vibrating "coaster" and sought out a table to sit at. For those who aren’t familiar with the Flying Fish, it is a self-service restaurant that operates in a manner similar to barbecue joints like Cozy Corner. That said, I thought it was interesting to see a “tips” jar at the order counter. I didn’t mind, because I believed that I was in for a great meal. Eventually my dinner arrived. I expected a small amount of food but what I got was enormous. The “sides” comprised most of my plate and was out of proportion with the entrée. I didn’t mind that at all, for everything was delicious. The catfish, covered with Veracruz sauce, was splendid. The sauce, consisting of white wine, onions and a mix of peppers (including jalapeños), added mild spiciness with a tinge of sweetness to the perfectly grilled filet. The sauce “spilled” over into the veggies, which turned out great. Even without the sauce, the beans and rice were marvelous. I’m not either a kidney or pinto bean fan, but the beer-doused legumes appealed to my inner kid. With all due respect to my Mom, I’m hard pressed in remembering from my childhood beans that tasted as good as what I had at the Flying Fish. Combined with the “dirty” rice and green onions, the Borracho (Spanish for "drunk") bean mix was excellent. With the Veracruz sauce, the beans and rice were outstanding. The grilled squash and zucchini were great as well. They were “al dente" in terms of firmness and very savory. Like the beans & rice, the squash and zucchini complemented the catfish extremely well. During the course of my meal, I finished eating the catfish with a lot of vegetables left. Normally that would be a bad thing, but the veggies were good by themselves. If the Flying Fish decides to develop a vegetarian menu featuring entrées like portabella mushrooms and tofu, I can see the restaurant having great success with it. Although I’m mostly a carnivore, this would really interest me. Far be it for me to offer advice, but I hope the restaurant looks in to this. SIDE NOTE: Speaking of looking into things, the Flying Saucer should research the feasibility of carrying Pabst Blue Ribbon (PBR). Given that its sister restaurant carries it, I can’t see the draught emporium having a hard time acquiring it. I’m guessing that both establishments use the same beer distributor (and possibly the same account). PBR seems to be working out at other Flying Saucers, so it doesn't make sense for the restaurant chain to deprive the Memphis locations of it. I believe it could be a nice alternative to a bad (as in Abita’s Turbo Dog) “Fire Sale” special. The way I see it, if it’s good enough for a classy restaurant like the Majestic Grille, then it should pass muster with the Saucer brass. sub-SIDE NOTE: I want to congratulate the Majestic Grille's Patrick and Deni Reilly on the birth of their first child, Seamus. Born recently, he has the best looks of both of his parents. I'm happy for them. Overall, the dinner at the Flying Fish was excellent. It far exceeded my expectations, which doesn’t mean that I was anticipating a bad meal. As for the original reason for reviewing the Flying Fish, I will say this: stick with seafood. The cheeseburger wasn’t anything special. For six dollars, the “Fish” provides a mediocre mustard-laden ¼ lb. patty cheeseburger and lightly seasoned fries. After the first bite, I feel that most kids will scream “I want McDonald’s” (or nearby Kooky Canuck). So with my primary objective culminating in lackluster fashion, I can take consolation in knowing where to get great seafood at a reasonable price. As for my unique burger quest, my next review of this type should yield better results. Stay tuned. Recently, on a rare Friday when I had to work at FedExForum, I decided to hit Lunchbox Eats for lunch. Located south of the arena on Fourth and Pontotoc, it was a very convenient option. It wasn’t the first time that I’ve dined there so I had an idea of what to expect. Lunchbox Eats features an eclectic menu of dishes that put a twist on school cafeteria and Southern cuisine. Most of the entrées are either hit (Homeroom Chicken & Grids; please read my review on Urbanspoon) or miss (3rd Period Smoking Birds), despite the menu descriptions. This day, I’ve decided to get the Graduation Burger. On paper, it seemed like a smart choice. So with my fingers crossed, I ordered it. The Graduation Burger is humongous. The “burger” is a half-pound meatloaf sandwich topped with pepper jack cheese, mashed potatoes, brown gravy, a tomato slice and fried onions, all within slices of lightly toasted bread. 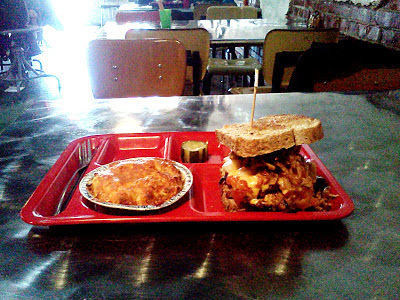 In appearance, the sandwich takes a cue from the Primanti Brothers, a popular Pittsburg diner. 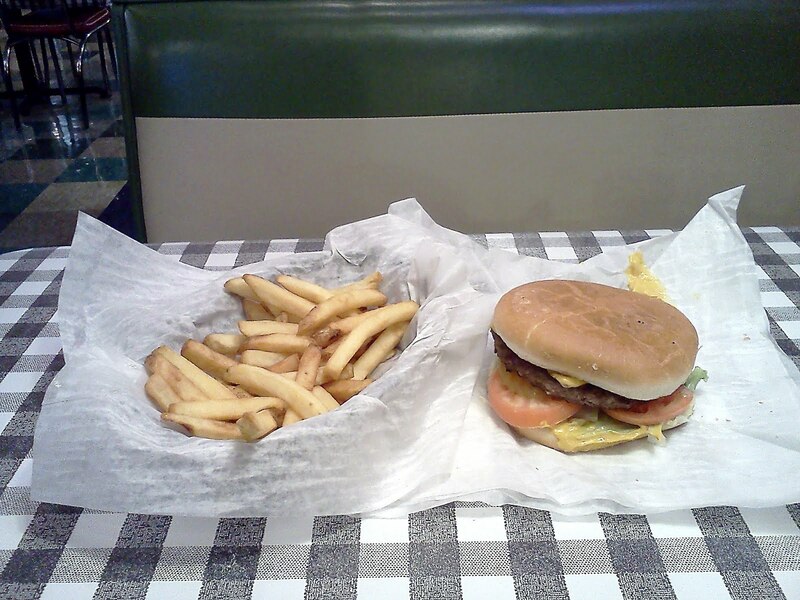 The Steel City restaurant is known for putting fries and other side items into the sandwich. Although I have never had a Primanti Brothers sandwich (although I might get an opportunity soon), the Graduation Burger comes close. It’s a complete dinner condensed into an enormous sandwich. After a couple of bites, I immediately got a sense of fullness from the sandwich. 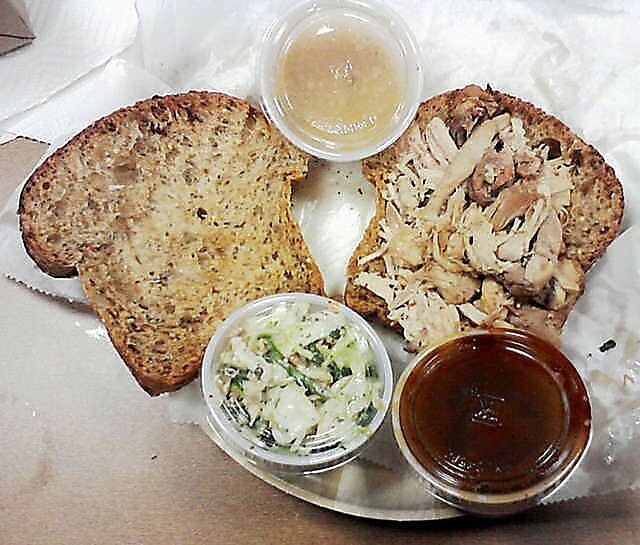 Unfortunately, this meal-in-a-sandwich came apart, for the gravy and other juices broke down the bread. Even after it disintegrated, it was still enjoyable to eat. SIDE NOTE: If Lunchbox Eats continues with this sandwich, it should consider crafting sturdier bread for it. The choices of wheat (which is what I had) and white bread aren’t suitable for a sandwich like the Graduation Burger. Although I’m clueless in offering advice on this, experts like Chef Jason Doty of Bluff City Coffee Shop can lend their expertise in creating the perfect “bun” for the sandwich. The meatloaf was very tender and tasty, boasted by the richness of the thick gravy. I liked how the pepper jack cheese melted into and accentuated the meatloaf. The fried onions’ zesty flavor gave the meatloaf a nice boost although it didn’t need it. Combined with the other toppings, the Graduation Burger is a very hearty and delicious sandwich. As for ordering sides, I intended to order fries with it. However, paying $3.49 for a pound of it didn’t appeal to me. From both a budgetary and appetite perspective, I had no need for a “Five Guys” experience. Instead, I went with a more appropriate choice of Mac ‘n Cheese. Although it wasn’t as creamy as I’m accustomed to, it still was a good match for my meatloaf sandwich. SIDE NOTE: A few days after my visit to Lunchbox Eats, a friend and I talked about one of its beverages. She recommended the Lemonade of The Day, which can come in a variety of flavors ranging from peach to my friend's favorite, watermelon. The restaurant makes this daily feature in-house and charges $3.49 for it. Although my friend loves it, the price is a bit high for me. After spending $13.59 (not including the tip), I would have been reluctant in ordering the drink. However, given the enormity of my meatloaf sandwich, I could have replaced the Mac ‘n Cheese with the lemonade and still had a great meal. The next time I visit, I’ll keep that in mind. Once I finished eating lunch, I pulled out my debt card to pay for it. What happened next was a revelation into the future. Instead of taking it to a cash register, my server swiped my debit card on an iPad. At first I thought it was neat, but that soured when I asked for a receipt. My server said that if I wanted a receipt, I would either have to give my e-mail address or cell phone number. I decided to do neither, because I felt it was intrusive on my privacy. Granted, this method of transaction isn’t much different from online purchasing at websites like Amazon. Even so, I didn’t feel comfortable with a restaurant having that much information about me. To some, my stance may seem like “tin foil hat” logic, but that’s how I feel. Putting aside my privacy concerns, my visit to Lunchbox Eats was great. It was satisfying to the point that I didn’t have a want of food for hours. I was so full that I almost felt like unbuttoning my pants at work. However, the likelihood of getting accused of sexual harassment prompted me to just chill. Whenever I return to Lunchbox Eats, I hope the next visit is as good as this one. 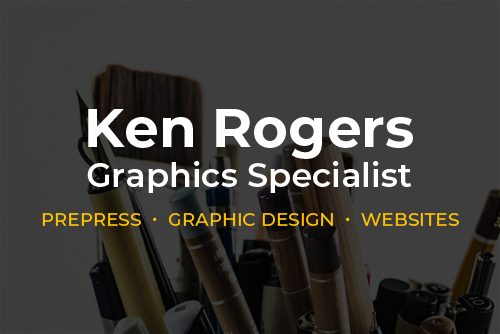 I want to thank everyone who has been supportive of my blogging efforts for the past 2½ years. It’s been a bumpy ride and I’ve made mistakes along the way. Despite that, I’ve done my best to produce something meaningful and thought-provoking about my dining experiences. Those who have visited this blog may not always agree with what I’ve written, but I hope they were enlightened nonetheless. As I move forward into 2013, I want to make the blog even better for those who appreciate it. Because of them (as opposed to the “haters”), I feel that blogging is a worthwhile endeavor for me. Again, thanks for the support because it means a lot to me.